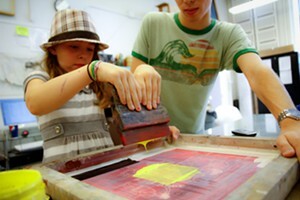 Friday Family Clay | BCA Studios | Classes (Paid) | Kids VT - small people, big ideas! Spend a Friday night with your family at the BCA Clay Studio. A ticket provides a wheel demonstration at the beginning of class, wheel access (for ages 6+), hand building for any age, unlimited clay, and time to create. Youth must be accompanied by an adult. Adults may assist their child(ren) free of charge. Additional tickets are required for adults who’d like to join the fun and either hand build or use a wheel of their own. If you’d like your work to be fired and glazed by the studio, there is a $5 fee per piece. Finished pottery will be available for pick-up three weeks after visit. Ticket purchases for this class are non-refundable. Fridays, Feb. 1-May 3, 5-7 p.m. $10/participant; $9/BCA members.